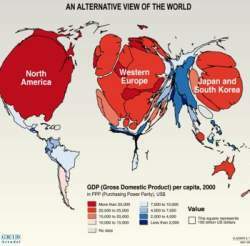 Interesting representation on map to highlight the distribution of wealth and power in the world of today, this cartogram sizes the countries according to their relative financial status, here presented through gross domestic product (gdp) per capita, offering an alternative world view to a regular map. Countries such as China and India become much smaller, next to giants in Western Europe, North America and Japan. Africa represents a minor speck, while South and Central America lands somewhere in between.